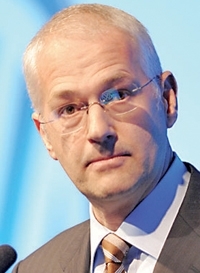 Main point: Volkswagen Group is not planning to expand its vehicle lineup into new segments. Quote: "We've got a pretty broad lineup today, so we are very much focused on more deeply penetrating the segments we're in, [rather] than necessarily expanding the portfolio." DETROIT -- Volkswagen Group will focus on improving its core lineup rather than entering new segments as it seeks more U.S. market share. Jonathan Browning, Volkswagen Group of America CEO, said there are no plans to introduce vehicles beyond what the company has announced. "We've got a pretty broad lineup today, so we are very much focused on more deeply penetrating the segments we're in," Browning told the Automotive News World Congress. VW needs to regain the spirit of when the Beetle and the minibus were U.S. cultural icons, he said. "Somewhere along the way, frankly, we lost our bearings in this market and we failed to build on that emotional equity and became more of a marginal brand," Browning said. He said the company must look at any small thing it is "tripping over," whether that is pricing, climate control, seat size or rear legroom. VW will look to its Jetta and Passat models for more U.S. sales. The 2012 Passat will be built at a new factory in Chattanooga. VW's 2010 U.S. sales of its diesel models rose 20 percent. In response, Browning said, VW will bring a diesel version of the redesigned Passat to the United States. He did not give a time frame. VW has already said it will bring the popular European Golf R to the U.S. market in 2012.